Some folks carefully tend their own gardens; as for me, I watch the leaves of others. After spotting the season’s first snowdrops several weeks ago, I’ve been stalking crocus buds, vowing to be on hand the moment they opened. Sure enough, yesterday’s sun was enough to push these petals toward blooming…and just as surely, today’s gray has forced them to fold. Such is the nature of spring’s ephemera: here yesterday, gone today. Once again, the picture illustrating today’s blog-post was the inspiration for today’s Tweet, illustrating the way these two media (blogging in both micro and macro modes) can feed one another. The time-traveler in me also wants to note that this year’s first crocuses appeared a few days before last year’s. When I tend to the backyard leaves I always tell myself that they are those of others’ too. Why don’t you come tend to mine for a change?? I would love to live near enough to come tend your leaves. But look: if you don’t remove them, they sprout flowers in spring. So there’s no harm, really, in leaving leaves. Just leave them be. What a cool website with simply fabulous photos. Love visiting old graveyards; there are some fabulous ones in Salem, MA. BTW…I am a big Boston Sports fan, especially the Sox. Thanks for visiting my Blog! Darlin’, you ain’t dat smart. The leaves I’m talking about are in my 7500 square feet of ponds. If I left them be, I’d have no ponds. No fish. No lotus blossoms. That’s where you come in, simply a day away. And here’s the deal: any that you haul out of the ponds you can take back to NH and plant flowers with. Hi, Diane–thanks for stopping by. I’m glad you’re a Sox fan rather than “the other kind.” Speaking of old cemeteries, I have plans to go walking at Mount Auburn Cemetery in Cambridge this weekend, so I suspect I’ll be sharing more cemetery shots next week. Karen, I now see what you mean. You aren’t talking leaves: you’re talking muck. And as curious fate would have it, I have a bit of experience cleaning pond muck, waaaaaay back in my years as a high school intern at the Columbus Zoo, where I once helped dredge a partially-drained duck pond. Talk about messy! That is a beautiful photograph. 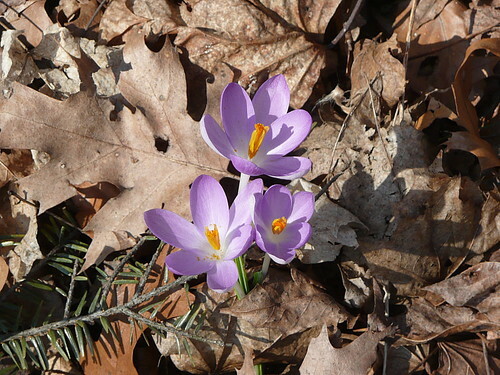 I’m somewhat envious – it will be weeks before our northern crocus (crocuses???) make an appearance. When that day arrives, I shall be tummy down in the dead leaves and the mud clicking madly with the Lumix.